Bear Hug: You’ve seen the gorgeous scenery of Lake Lure, North Carolina, if you’ve ever watched the classic movies Dirty Dancing or Last of the Mohicans. Come spend some time in this beautiful and cozy log cabin home, enjoying pristine views of Chimney Rock throughout the change of seasons from the rear deck. If you like cooking, Bear Hug has all the amenities, including a full line of stainless steel appliances, cook top stove, utensils, blender, microwave and more. The dining area seats 8 and just through the French door is a gas grill on the rear deck to cook a great steak while taking in the outdoors and the cool mountain air. The living room sofa pulls out to a queen size bed. Relax with friendly conversation, a movie,or a book. Maybe even pour yourself a glass of wine and sit in front of the gas log fireplace. There is local phone service, but most cell phones work well at Bear Hug. Enjoy Direct TV with DVD/VCR and WI-FI access. Bear Hug boasts upper level master bedroom with queen bed and a private full bath. The loft area provides a quiet area to enjoy a book, play board games, or surf the internet. The loft also has a futon and a small balcony to enjoy the mountain views. Stacked washer and dryer are also available. Main level guest bedroom has two twin beds and the full bath. The lower level bedroom consists of two sets of bunk beds for the kids. There is also an additional futon in the lower level. A full bath, second gas log fireplace, TV, and kids air hockey game rounds out the area. 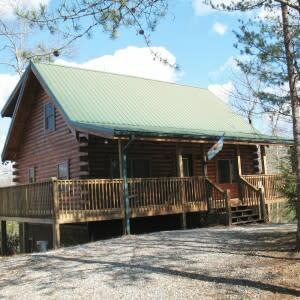 This classic log cabin has 1,344 square feet of spacious living area and all the comforts of home. The cabin was built with fine quality features including gorgeous open beam construction, hardwood floors, metal roof, Pella windows, Carrier central air conditioning/heat, full front porch, and wrap around side and rear decks. 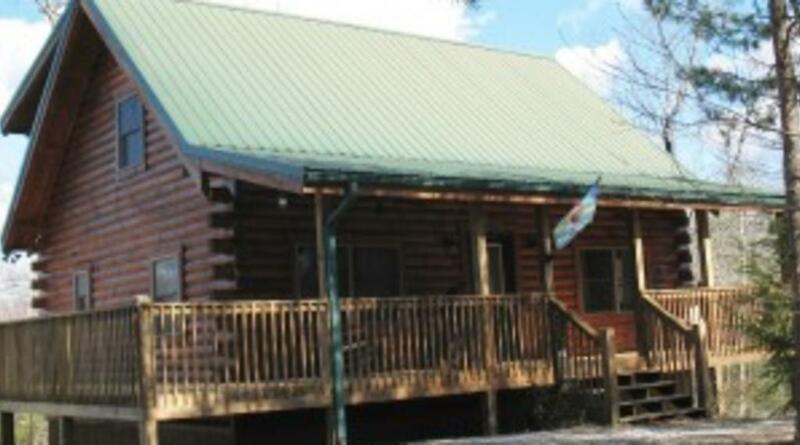 This very clean, non-smoking log cabin is on a wooded 1+ acre parcel in Riverbend. Residents and guests of Riverbend enjoy the EXCLUSIVE use of two private lakes, a beautiful beach, hiking trails, waterfall, and picnic area. The Broad River also runs through Riverbend, which is fun for tubing, fishing and swimming at the Old Swimming Hole. Turkeys and deer are common sights in the area. Not far from Bear Hug you will find two championship golf courses and one municipal golf course. Boat rentals are available for your enjoyment at Lake Lure, which has excellent dining and a popular beach for the children. Visit nearby Chimney Rock Park and Village, with its spectacular views and quaint shops.